A video that purportedly shows a living, breathing space alien will be shown to the news media Friday in Denver. Jeff Peckman, who is pushing a ballot initiative to create an Extraterrestrial Affairs Commission in Denver to prepare the city for close encounters of the alien kind, said the video is authentic and convinced him that aliens exist. “As impressive as it is, it’s still one tiny portion in the context of a vast amount of peripheral evidence,” he said Wednesday. “It’s really the final visual confirmation of what you already know to be true having seen all the other evidence.” When Peckman went before city officials this month to discuss his proposed ET initiative, he promised to show the video. But people won’t have to wait too long to see it for themselves. “There is an open, public meeting in about a month in Colorado Springs,” Peckman said. “We’ll hope to do one in Denver at some point, and then in a few months, there will be the documentary that anybody can have, and it’ll have the footage.” An instructor at the Colorado Film School in Denver scrutinized the video “very carefully” and determined it was authentic, Peckman said. Um, this could be fun. Sorry but how could one really believe anything they see on tv? Let alone in the sky. I say, until we are flying to Tokyo for lunch on one of those Nazi-post war saucer things – its fake. Is an instructor to a film school a forensic alien cinematographer? No it won’t…The video show is a hoax, and we can see that in a few months. Some people just have too much time on their hands. This is old news, didn’t Commander Riker show an alien autopsy on TV years ago? So we get to see a picture of James Hill. BFD. Yes, if he has a video why not show it now, or post it on you tube? Money is the obvious reason but a teaser would bring more money. Most likely another waste of time. #2 – You’ve got it all wrong! Camcorders don’t work around ghosts! LGMs (Little Green Men) ? Yeah, sitting in the Flying Saucer, right next to Elvis !!! The presentation may be delayed a few hours due to rendering errors. It’ll be a wealthy old guy with a bald head who’s had lots of medical treatments giving him an odd glow. What if it’s simply an expose on the meteor they fund in Antartica of the rock that supposedly contains Martian microbes? Wouldn’t Martian Microbes technically qualify as “ET’s”? Is there an alien-based movie coming out Friday? What if “the aliens” looked identical to us and made their spaceships in the shape of Boeing 747s? Har! I’ve been waiting mere minutes for this announcement… What? … I have to wait several hours? If this turns out to be even remotely credible, the ol’ Rapture Index oughta spike like a republican on viagra in an airport restroom. Maybe the aliens want to negotiate with Morgan Spurlock for face-time with Bin Laden. 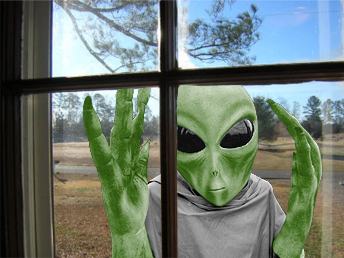 So, aliens are peeping toms?!? Nasty little buggers. Does that make it close encounters of the skeezy kind? I hope they are really hot, don’t mind doing house work and give a great snarlin’ gnarlin’. I hope this isn’t similar to the Arizona Governor’s “Space Alien” Press conference. That one was a totally disgusting accusation that the thousands of people that saw the Phoenix lights were looney. Did anyone see this today? Link? Look on Gizmodo for the video (I think they have the one the guy is claming is real). Looks like any ordinary faked video. It won’t be aired today. Mr. Pecker wants to milk it for what it’s worth… while he can. Once released it will be a person with an alien mask or something.